From the highs of the Steve Jobs portrait made out of 20lbs of electronic waste, to the lows of the hideous statue that looked like a totem from Hellraiser, there have certainly been some “uneven” tributes to Apple’s late co-founder. So which camp does this creation fall into, then? 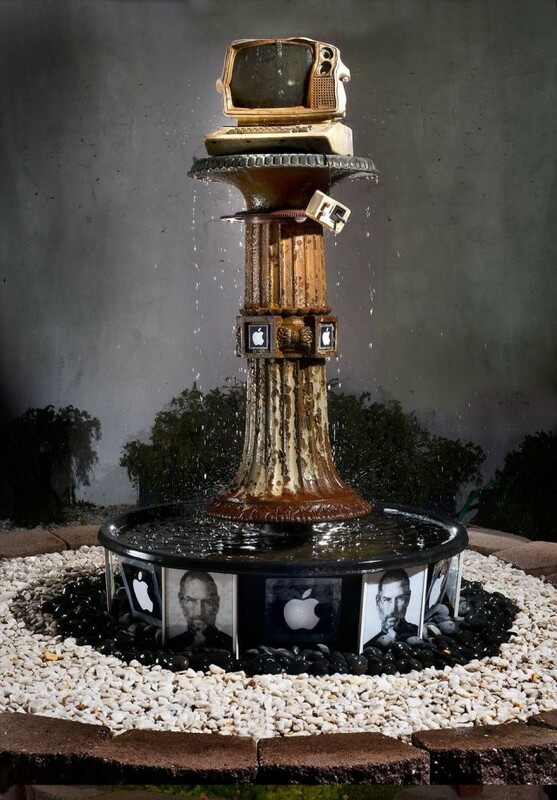 Called “Baked Apple,” the fountain-sculpture depicts a deformed Apple II sitting on top of a column (previously the base lamp), adorned with images of Jobs and the Apple logo. It was created by artist Robbie Schoen, who once attended Jobs’ alma mater. Schoen, and made his creation with the aid of a real-life Apple II, formerly belonging to the school’s science department. Schoen began the sculpture in the mid-1990s, and even sent photos of it to Jobs when he was in the process of returning to Apple at the time. However, it was Jobs’ death in 2011 that made Schoen finish the artwork, and display it. It can currently be seen outside the Felix Culpa Gallery in Santa Cruz, California.